A true Alaskan adventure. When we weren't expecting one. The taxi retreated around a far corner, leaving my hiking partner John and me standing alongside our packs on an otherwise empty road a dozen miles north of Juneau. I couldn't put off shouldering that sixty-pound pack much longer. Wanting just a few more packless moments, I wandered over to sign the trail register. I glanced up at the signpost. What the heck? We were at the wrong trailhead! Instead of getting an early start, a bit of quick mental math revealed that we would now have to walk another three miles up the road before we hit dirt. Another three miles carrying that overweight pack. To calm myself, I opened the trail register and skimmed through it, reading what others had thought of this trail we weren't going to be hiking. "No bears, lots of bugs" read the last entry. I had just repeated this nugget out loud to John when suddenly I became aware of a commotion a few yards to my right. A big commotion that made the ground shake. A big, black commotion with a snout pointed in my direction, making a raspy grunting sound that would put most snorers to shame. In short, I found myself looking at a fully grown Alaskan black bear doing its best to look menacing. My first reaction was to reach for my camera. Indeed, my hand was already inside the chest pouch when my brain caught up. Black bears don't usually hold their ground and show aggressive behavior unless: (1) they're protecting a kill; or (2) are a sow protecting her cubs. In either case, the bear doesn't want you around, and you should take its advice. The pepper spray I had purchased at the store next to the airport only an hour earlier was still in its protective shrink wrap, shoved without thought into my pants pocket. Uh-oh. I turned to point out the bear to John. He must have seen it himself, as he had already retreated to the side of the only vehicle in the trailhead's parking lot, a VW bus plastered with Peace and Love bumper stickers and which had apparently survived the 60's by heading north. John didn't say a thing, he simply pointed to my left. Damn, I was between a sow and her cub. I fumbled with the plastic wrapper that entombed my sole defense as I slowly backed up. Without warning, the mother bear went bolt upright and looked to its left instead of me. I followed her glance. Two dogs had rounded a corner of the trail a hundred yards away and were now gleefully headed my way in full welcoming trot. Way uh-oh. What had started as a simple problem of being in the wrong place was now a potentially disastrous example of being in the wrong place at the wrong time in the wrong company. The way the trail arced down from the ridge, the dogs couldn't yet see the bear. Apparently the bear could smell the dogs, though. Fortunately, the dog owners had rushed around the corner in pursuit of their dogs. "There's a bear down here!" I yelled, a bit of desperation in my voice, hoping they were Alaskan enough to know to call back their dogs. They were and they did, and, surprisingly, the dogs obeyed. But mother bear was still quite disturbed and I hadn't backed up much yet. Her cub also hadn't yet come to her side. Instead, the cub stood in place making a little wailing sound that was obviously a cry for help; the whimpering cry was so sorrowful, I wanted to run over and help the cub, though I knew that would be the stupidest thing I could do. Momma bear began to prance back and forth in front of me, alternating between stomps and snorts. The dogs, held up the trail by their owners, had finally scented the bear and were doing their best to bark the intruder away. Behind me, John had put a foot on the VW's bumper, and appeared to be looking for a handhold so he could climb on top of the vehicle. As for me, I started talking to the bear, telling her that I was sorry for pestering her, all the while slowly backing away. I held my now-unwrapped pepper spray in front of me as my last defense. 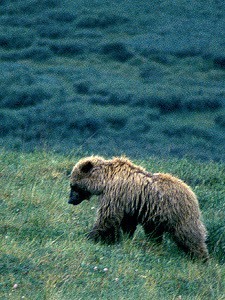 As I cleared the path between the bears, the cub let out a final whelp and ran to join her mom. Almost immediately, the two bears disappeared off into the bushes, and the receding sounds of branches being pushed and snapped in hasty retreat gave us all a pretty good indication of how fast the bears were moving away from us. Wait a second, we were still at the wrong trailhead! Sigh. Alaska has a way of throwing you curves, even on the most convenient of backcountry escapes.